Healthy fish can easily go a week without food. If you are only going away for a few days, don't bother getting someone to feed your fish. 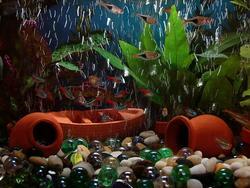 Fish feeders are available which dissolve slowly and release food but these may upset the ph in your tank. If you're going away for longer than a week you will have to make arrangements for someone to feed the fish. You will probably have to find a friend or neighbour willing to call by every few days. If they are not experienced at keeping fish they may tend to overfeed your fish and the best way to avoid the risk of this happening is to make up individual packages (such as small envelopes) each containing enough food for one day. The fish don't have to be fed every day, and shouldn't be given more than one days food at a time, even if they've gone a few days without. Be sure to warn your helper not to make up for days they have missed by giving extra food. If your tank has a high evaporation rate you may also want to arrange for it to be topped up with fresh water but be sure to explain that water should be at room temperature and not contain fluoride. Don't add any new fish in the month before you go on holidays in case they introduce disease that takes some time to develop. Clean your tank and filter and do a normal water change the week before you go on holidays. Looking after someone else's fish can feel like a heavy responsibility, and your helper might have more peace of mind if they have the number of a pet store or aquarium to call for advice in an emergency.